Would you believe that there are links between president Lincoln and Kennedy? It may seem odd to link two great leaders that are separated by nearly a century, but the connections go very deep, and are eerie to say the least. But is it some kind of message, a deep meaning, or just pure coincidence? First we must look at the list of links between president Lincoln and Kennedy and then decipher them. The following list is but one of many that have been circulating from the day after president Kennedy lost his life. They both married while in their 30’s to women in their 20’s. Lincoln was first elected to congress in 1846, Kennedy was elected exactly 100 years later. Kennedy was unsuccessful as Vice-Presidential candidate in 1956, Lincoln failed in the same pursuit 100 years earlier. Lincoln was elected as President in 1860, Kennedy in 1960. Kennedy and Lincoln were both elected with less than 50% of the popular vote. Both their last names contain 7 letters. Kennedy’s secretary was named Lincoln and Lincolns secretary was named Kennedy. While Lincoln was Republican, and Kennedy was Democrat, they both actually represented the same side of politics. The Republican Party was originally the liberal, progressive party, and the Democrats were the conservative party. Both Lincolns and Kennedy’s wives lost children while they were in the White House. Andrew Johnson, who was a southerner, succeeded Lincoln and he was born in 1808. Lyndon Johnson, who was a southerner, succeeded Kennedy and was born in 1908. John Wilkes Booth, who assassinated Lincoln, was born in 1839. Lee Harvey Oswald, who assassinated Kennedy was born 100 years after Booth in 1939. Lincoln was assassinated in a theater names Ford. Kennedy was killed in a car called Lincoln which was made by Ford. Booth left a theater and was caught in a warehouse, Oswald left a warehouse and was caught in a theater. Lincoln and Kennedy were assassinated just prior to a holiday. Lincoln before Easter and Kennedy before Thanksgiving. Both Oswald and Booth were killed before they could stand trial. Both Lincoln and Kennedy had dreams of their impending doom within a month of their deaths. Both Kennedy and Lincoln were both shot while their wives were present. Both Booth and Oswald were known by their 3 names, and they both have 15 letters in their names. Both Kennedy and Lincoln were concerned with civil rights. They were both shot in the head on a Friday. They were both shot by southerners. 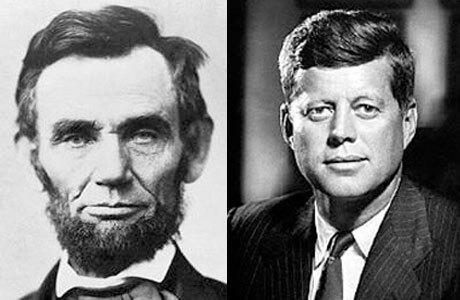 Lincolns challenger for President was born on 1813, Kennedy’s challenger was born in 1913. Both Lincoln and Kennedy tried to end the federal reserve banking system. As you can see, the list of links between president Lincoln and Kennedy is fairly extensive, and for the most part true. But how much of it can be written off as just a coincidence? Lets take a deeper look. 1. Both married in their 30’s to women in their 20’s. Correct, but there shouldn’t be too much in it. Many men marry women their junior, and Lincoln himself was not very far into his 30’s when he wed.
2. They were elected to congress 100 years apart. Yet another technically correct statement, but given the routine frequency of the electoral process, there was always a chance of such an outcome. But their political careers were very different while trying to get elected. Lincoln had several failed attempts at election on the national floor. Kennedy on the other hand had massive electoral success. 3. Not true. Lincoln did fail in his attempt, but Kennedy didn’t run in 1956. The running mate of Adlai Stevenson, the Democrat candidate was Estes Kefauver. 4. Both elected president 100 years apart. Another correct statement, but given the electoral cycle, it was bound to happen. 5. Both were elected but didn’t win 50% of the popular vote. Another technically correct statement. In the 1860 election, Lincoln won the majority of votes, 39.65%. Because there were four candidates for president, the popular vote was always going to be small. Technically, to win the popular vote you need over 50% of the vote. Kennedy failed to reach this mark, but only by 0.28%. But he still beat his opponent, Richard Nixon by 0.17%. Kennedy was still the most popular choice among voters. 6. Both their names contain 7 letters. Correct, but still another massive coincidence, and shouldn’t be looked too far into. For the record, the average length of presedential surnames is 6.64 letters. 7. Lincoln had a secretary named Kennedy, Kennedy had one named Lincoln. Only half right. Kennedy did indeed have a secretary named Lincoln, but there is no record anywhere of Lincoln having a secretary named Kennedy. 8. Although technically correct, there was a fifty percent chance that they would not have come from the same political persuasion. 9. Both the presidents wives lost children while in the White house. Another technically correct claim. Lincoln lost his teenage son to typhoid after only a year in office. The Kennedy’s lost their premature baby two days after it was born. So while it’s a correct statement, the causes couldn’t be further apart. 10. Both of their successors were from southern states and born 100 years apart. Another technically true statement. It is itself odd that both men would be born 100 years apart, but not as far fetched an idea that you would think. Just the simple fact that there was 100 years between the two terms, and the average age of politicians leads to a situation where it was technically possible anyway. As for them both being from southern states, this was a result of politics at play. To gain support in southern states, and win an election, both Lincoln and Kennedy needed some form of representation from that region. Selecting a running mate from the south gave them a little lift at the polls, so not too much to look at here. 11. Both assassins were born 100 years apart. Booth in 1839 and Oswald in 1939. This is wrong, but only just. Booth was born in 1838. 12. Lincoln was killed in a theater named Ford, Kennedy in a Lincoln that was made by Ford. Again correct, but is only really a play on words and coincidence. 13. Booth left a theater and was caught in a warehouse, Oswald left a warehouse and was caught in a theater. Not quite right. Booth was caught in a shed, not a warehouse. The theaters too were different. One was for plays, the other for movies. 14. Both killed before a holiday. True too, but they were also killed after a holiday. As holidays always come and go, this is just a silly claim. 15. Both assassins were killed before standing trial. Another true statement, but not that odd. 16. Both presidents had a premonition of their deaths. Not true. While Lincoln did, there has been no verifiable statement that Kennedy did. But it would be possible for him to. Being in a position such as president, where other men before you have lost their life at the hand of an assassin, would definitely stir feelings of possible death. These feelings could possible manifest themselves in dreams. 17. Both shot in the presence of their wives. True, but in many public outings the Firth lady is always present, so not a big deal here. 18. Both assassins known by three names, and had the same number of letters. Another true claim. But most people have three names, and by chance, the average letters used will be somewhere in the vicinity of 15 letters. So not really anything looking into. 19. Both Kennedy and Lincoln were concerned with civil rights. What politician isn’t? Hardly a coincidence. 20. Both shot in the head on a Friday. It makes sense to shoot someone in the head. Oswald was a marksman, while Booth was literally at point blank range. Taking a head shot ensured success. As for a Friday, the chances of this happening are very high. Most public functions occur over weekends, and Fridays usually encompass these days. So when you think of the number of days in a week, increasing the possible days to three makes it even more likely. 21. Both shot by southerners. Dubious claim here. Booth was born a northerner, but obviously had close ties, politically, with the south. Oswald was raised in the south, but he didn’t act out of regional allegiance. 22. Lincolns challenger for President was born on 1813, Kennedy’s challenger was born in 1913.Richard Nixon was indeed born in 1913, but there is trouble brewing with Lincoln’s challenger. Lincoln faced three challengers. One adversary was John Breckenridge, who was born in 1821. The next candidate was John Bell, who was born in 1796. His closest candidate was Stephen Douglas, who was born in 1813 does give some credit to this statement. But he did face off against three other men, so the chances were narrowed down somewhat. 23. Both men tried to end the federal reserve. Not true. The federal reserve wasn’t even a part of the landscape when Lincoln was president, so it could never have happened. While this list of links between president Lincoln and Kennedy has a lot of close connections and coincidences, it should only be viewed that way. As a coincidence. But it is always up to the reader to determine how they view things. Previous article Donald Duck Banned in Finland? True or False?